Every year OpenSesame is lucky to host talented interns from colleges around the United States, and this year is no different. Help us welcome our 2015 Summer Interns! I was born and raised in Portland, OR and am excited to spend the summer there as a Marketing Intern for OpenSesame! I recently graduated from Lincoln High and plan to attend Whitman College in the fall. As an undecided freshman, I’m hoping to take a course that unexpectedly draws me in, but for now, I am curious about the Environmental Studies, Linguistics, and Business departments. I strongly identify with the poet, Spanish-speaking, nature-enthusiast, and artist communities. Being creative is my jam, and this summer I’d like to broaden the left-side of my brain as well. At OpenSesame I hope to be able to make a true impact, and learn more about B2B marketing strategies. I’m a native Portlander from the West Hills. After graduating from Jesuit High School in 2014, I started school at the University of Washington in Seattle where I just completed my freshman year. I am working towards a B.S. in Computer Science with either a minor or double major in Math. Playing for the UW Club Squash team and working as a Student Lab Assistant keep me busy during the school year. I’ve been at OpenSesame on and off since 2013 and I look forward to another great summer here. My name is Alex Kanevsky, and I am a new addition to the OpenSesame marketing team. 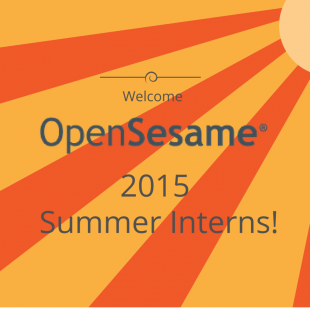 I’m quite thrilled to be an intern for OpenSesame, and I hope to create a lasting impact and exceed expectations. I am currently a rising sophomore at Bard College in New York, majoring in philosophy and psychology, with a concentration in sociology. My current career interests are advertising, marketing, sales, and perhaps teaching. My favorite non-curricular interest is engaging in discussions about anything and everything remotely philosophical, and then writing my own philosophical texts. I heavily enjoy discussing and writing about sociology, humanistic philosophies, and Universe Theories. For fun, I spend my free time skateboarding, playing and observing strategic games, reading, listening to music, and learning music theory. I can’t wait to use my skills and interests to give back to OpenSesame this summer. I just finished up my junior year at Montana State University and have come back to Portland for my final summer vacation. I was a part of OpenSesame’s intern class last summer, and have been working remotely for the company since January of this year. My time at OpenSesame has taught me so much, and I really look forward to learning even more during my time here this summer. In my free time I enjoy playing video games, and will be trying to get back into basketball after a series of shoulder surgeries sidelined me for the past two years. I also really enjoy driving. My friends and I have planned a two week road trip for this summer, so I am really looking forward to that. I was born and raised in Eugene, but I left home to attend St. Olaf College in Northfield, Minnesota. I just graduated with my B.A. in English and I’m thrilled to be back in the greener, less snowy, and beautiful Pacific Northwest. This summer at OpenSesame, I’m excited to blog and put some of my writing and editing skills to practical use while learning more about the tech industry, eLearning, and online writing. At St. Olaf, I was involved in the English Honor Society, Sigma Tau Delta, and I worked as a peer writing tutor. I spent a month studying English and Theatre in London (where I saw a play nearly every day) and a semester conducting humanities research at the Newberry Library in Chicago. It’s no surprise that I’m a huge book nerd, so outside of the OpenSesame office you can probably find me in my favorite place in Portland, Powell’s. When I’m not reading, I’m exploring Portland’s foodie scene and hiding out in its coffee shops. I love the creative energy of Portland, and I’m excited to experience more of that culture this summer at OpenSesame! Hello! My name is Dana Rosen and I’m thrilled to return to OpenSesame as a Marketing Intern this Summer! Though I’m originally from Oregon, I ended up in the lovely Bay Area for college. This year, I am a rising senior at UC Berkeley where I’ve designed my own interdisciplinary major combining cognitive science and technology entrepreneurship. Initially my interest in technology and education drew me to OpenSesame, but the awesome people and great company culture had me coming back for more. When I’m not writing blog posts, updating course pages, and cleaning up spreadsheets, I’m working in my lab at UC Berkeley in the Graduate School of Education where we’re designing a virtual tutor using cutting-edge gesture models, eye-tracking, and animation technology that may eventually be used in classrooms. Currently I’m working for OpenSesame remotely while living in Berkeley, interviewing students as they use my lab’s device, and iterating new designs. I’m very excited to use this experience and my experience at OpenSesame to join the elearning and edtech space upon graduation. During my free time I love exploring the Bay Area, hiking, going to concerts, and trying delicious vegetarian food around the city. I’m so excited to meet this year’s new interns and I look forward to see what this Summer brings! As a Portland, OR native, I have always been interested in the thriving start-up community that this city has to offer. Although I have never worked for one, I’m eager to learn how tech start-ups function and grow. My interests lie particularly in the business/finance side of a company, but I’m always open to learning about other areas of a firm. I recently completed my Freshman year at Tufts University and plan to major in Economics with a minor in Finance. At school, I’m involved in the Tufts Financial Group and the Zeta Psi fraternity, where I will be the treasurer for the 2015-2016 academic year. I also am an avid Tennis player and played competitively throughout high school, however I recently picked up Squash and have loved it just as much. I’m excited to continue my internship here at OpenSesame, where I will be given the opportunity to learn extensively about the inner workings of a start-up and the progress of elearning. Hello! My name is Simone Smith and I am a new Marketing Intern for the summer. I am a proud Portland native and am majoring in Business with a concentration in Marketing and a Spanish minor at the University of Oregon. I heard about OpenSesame from friends familiar with the Portland startup scene and immediately became interested in the company. My interest in marketing stems from my involvement with the University of Oregon’s American Marketing Association (UOAMA). Since becoming a member my freshman year, I have served as the Vice President of External Affairs and am the current Executive Vice President of the student-run club. What excites me most about the student organization is being able to organize site visits to marketing firms to learn more about the industry. Outside of school I love learning about the wine industry. I had the wonderful opportunity to work with the Antinori winery in Florence last summer as I was studying wine marketing in Italy. Since then, I have enjoyed learning more about the pinot noir scene in the Willamette Valley. Additionally, I love discovering new restaurants and places to eat in my free time as I consider myself to be somewhat of a “foodie.” I am extremely happy to be back in Portland and to be starting my new adventure at OpenSesame. I am currently a sophomore at the University of Michigan, and will be majoring in International Studies with a focus on Political Economy and Development. At school, I am the president of the Japan Student Association, and an active member of Epsilon Nu Tau, a co-ed entrepreneurship fraternity. I am ecstatic to be living in one of my favorite cities that I have been lucky to call my home for the past 20 years. I love running, and will hopefully be spending much of my free time outdoors. Although I do not have previous experience in marketing, I am looking forward to learning more about the field, and seeing how my skills can contribute to the growth of this company. I am grateful to be surrounded by such ambitious, creative individuals and am excited to immerse myself in an office filled with so much entrepreneurial spirit. I just finished my sophomore year at Miami University of Ohio, majoring in marketing with a minor in Information Systems & Analytics. I am ecstatic to work as part of the OpenSesame team, developing web content and working with SEO strategies. The eLearning marketplace is still in the beginning stage of market competition, and I am looking forward to working with what I believe will be the future dominant company in this marketplace. Outside from work, I enjoy running, hiking, and any combination of music and the outdoors. I recently moved to Portland with my family from Kansas City and am excited to explore all the opportunities and events Portland has to offer this summer! Hi! I’m a rising senior at Carnegie Mellon University in Pittsburgh, majoring in Business Administration and Psychology. I’ve lived all over (I currently call Destin, Florida home) but I’m so excited to be working with OpenSesame in Portland this summer. At Carnegie Mellon, I’ve been a board member with the Carnegie Mellon Business Association and a research assistant. I’m interested in the psychology behind marketing and I hope to be able to apply my background to pursue a career in marketing. Outside of work and school, I enjoy travelling, painting, cooking, and spoiling my Golden Retriever, Milo. Whether hiking in Oregon or kayaking in Florida, I love to spend time outdoors and I hope to take advantage of my time here in Portland to explore the natural beauty of the Pacific Northwest. I’m looking forward to all the new experiences and opportunities I’ll have while learning about marketing at OpenSesame this summer!